Belmont Regional Park is an awesome place for getting out for a walk in Wellington. It’s central (literally), very accessible on most sides from public transport, and from Belmont Trig it’s possible to see how a large number of pockets of the Wellington Region all fit together. Wellington’s roads are laid out to divide the Porirua side of the region from the Hutt side in a way that causes many people to assume that they’re a long way apart. For myself, it really wasn’t until I walked through Belmont Regional Park that I really appreciated just how close the Hutt Valley is to Porirua. Being able to see them both from a central point and then be down on either side in the time of an hour or so is a really cool thing. From Cannons’ Head down to Stratton Street. I had some free time during rather nice weather on Sunday, and decided to drive out to Petone and spend it doing exactly this. With the opportunity, I also decided to do some red lining and take a look around a few areas of Belmont Regional Park where I haven’t yet been. Location: Belmont Regional Park, from Cornish Street. 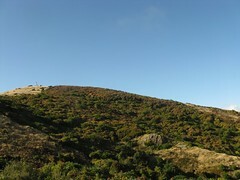 Route: A clockwise loop up to Belmont Trig via Bridleway, over to Cannons’ Head, down to Stratton Street and back to Cornish Street via Korokoro Dam. I began in a place where I’ve entered the park many times before, at the end of Cornish Street in Petone. Cornish Street is an industrial street and although there’s a modest amount of public parking at the end, near the entrance to the park, it doesn’t have much other space where public parking is legal. This is, at least, what I discovered for the first time yesterday having turned up shortly after what I think were people from a tramping club milling around their cars, though I didn’t ask which one. The street is incredibly wide and quiet, but it wasn’t until I had to find somewhere else to park that I discovered virtually the entire length of the street is made up of industrial driveways and access points to private parking spaces. I did manage to find a legal area about 100 metres away, though, and left at about 9.30am or thereabouts. My usual way in from here is to walk up to Belmont Trig via the main ridge track up from Baked Beans Bend, but this time I thought I might try to red line some of the parts I hadn’t been to before. For this reason, I decided to head up to Belmont Trig via the Bridleway track, which (from the Korokoro side) coasts around the back of Belmont Peak before climbing up the far side. Baked Beans Bend is about 15 minutes further up the track. There’s an ad-hoc camp-site here (though I’m not sure the regional council would appreciate someone having a campfire as has obviously happened), and it’s here where the route begins to climb. It’s also very soon after this bend that the main Belmont Trig track splits from the Bridleway Track. The Trig track climbs more or less evenly up its spur, but the Bridleway track hovers in the depths of the valley for a while, undulating up and down a few times. The R27 Wellington LINZ map from the 260 Map Series (published 2006) then indicates that the Bridleway track climbs sharply up a spur further further around, shortly after it splits again with the other option heading out to Horokiwi. This is what I initially thought I was going up when the track very obviously split, and it definitely climbs steeply. It turns out there’s another spur between the Trig Track spur and the Bridleway Spur, though. Half way up, I saw a pole further around to the hill-side, and after some checking of my map I figured out I was on a track the map hadn’t marked. The two spurs joined each other, though, so I ended up in the same place where the Bridleway Track emerges not far below Belmont Trig. Trig from Baked Beans Bend. On a nice day in Belmont, it’s unusual to go without seeing many people, and I expected to encounter others by the time I reached the trig. There was nobody. The morning was sunny, virtually no wind, and there was nobody. 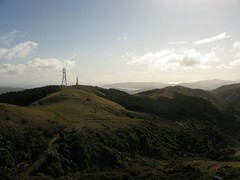 At 457 metres above sea-level, Belmont Trig is the highest point in the centre of the Wellington Region. 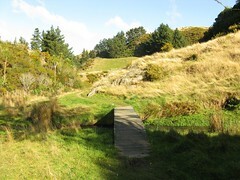 It’s not above any natural bush-line, but the park is a farm park and there comes a point where one emerges from the native bush into council-operated publicly accessible farm-land, and there’s a similar sentiment to reaching the tops in New Zealand’s more mountainous back-country. I sat under the trig, spent a couple of minutes strapping my feet, hoping to ward off blisters from only the second outing of my new Scarpas, then I found a grassy patch slightly down the side of the hill and stared towards the Tararuas which were basking inside some grey cloud. Colonial Knob behind Porirua, and on the edge, is slightly higher than this, but to be well above Belmont Trig without flying, it’d be necessary to be in the Rimutaka Range to the east on the far side of the harbour (the Mt Matthews high point in the distance is a little over twice the height), or in the Tararua Range to the north where Mitre Peak is more than three times the height of Belmont Trig. 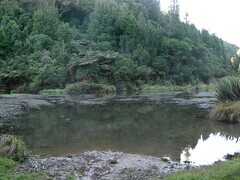 From here, though, the Tararuas were still a cloud-covered smudge in the far distance. 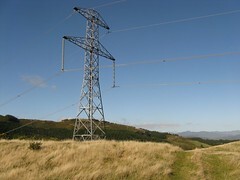 Say what you might about high tension power cables being strung over regional parks, they make it much easier to identify locations on topo maps. As I sat on the northern slope of Belmont Peak with the map unfolded in front of me, it was easy to pick out the upcoming route around Cannons’ Head, down a spur to the Stratton Street park entrance that I’d visit before continuing back to the Korokoro Dam. After 15 minutes of sitting on the grass-covered slope, I eventually heard the chatter of a group of people approaching up the main ridge from Baked Beans Bend, and with the peak about to be overrun by the next group of day-walkers it was time to carry on. 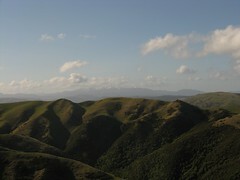 The Tararuas from Cannons’ Head. It took about 40 minutes to reach Cannons’ Head, during which time I passed one enthusiastic mountain runner and nobody else — surprising given the weather so far. Cannons’ Head shares a name with Cannons’ Creek, visible below, which is one of the fore-mentioned locations in which lots of state housing was built during the mid-20th century. In the past the area has had a reputation of one of the highest crime rates in the country and admittedly it was an area I tended to avoid when I was growing up nearby, but I’ve walked through it several times in the last few years when approaching Belmont Regional Park from the other side, and I’m actually really impressed with how it doesn’t feel anything like as run-down as it used to. It’s possible to walk down the street as a stranger and smile at someone, and get a smile back. Perhaps there’s more pride in living there than there used to be, or maybe I’m just imagining a difference where the only difference has been inside my head. Either way it’s really neat. Not being in any kind of rush, I once again managed to find a nice place in the grass near Cannons’ Head where I could sit for another 10 minutes and gaze towards the Tararuas. By now they had emerged from the grey clouds and were showing some snow-covered peaks. Perhaps another day. Leaving Stratton Street towards Belmont Trig. The walk from Cannons’ Head down to the Stratton Street entrance took about 25 minutes down a spur, and there’s a picnic area that seems quite nice in the sunshine. Not having left a vehicle here, though, I followed the signposted track back up towards Belmont Peak. 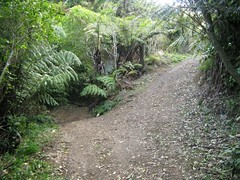 After only 10 minutes, the track splits off with one branch heading further up open farmland towards Belmont Trig, and the other directed into the bush in the direction of the Korokoro Dam. Even though it’s a direct route between nearby entrances, this track is actually really steep by regional park recreational walking standards, and I expect it could be quite slippery when wet. Before reaching the Oakleigh Street entrance, the track around here also criss-crosses a stream in a way that was fine with tramping boots, but it’d be a challenge to keep dry feet if attempting to walk the track with regular shoes (and a dry-feet attitude). This section of track along here is very accessible, and from this point on there were many more people out for casual walks in t-shirts and with handbags and such. Nobody was at the Korokoro Dam when I reached it 40 minutes after leaving Stratton Street, and I sat for five minutes to study a couple of ducks that very slowly made their way over the artificial lake behind the dam. From the dam, it was a 45 minute casual walk back to Cornish Street. All good. Hi Mike, sounds like you went up the new bridleway track that was cut over the summer to facilitate pest control from quad bikes. As you say, the new track joins the old one part way up, but it is now a much wider vehicle track, and from the bottom it connects more directly with the track heading up to Horokiwi (which has also been widened – presumably the access point for pest control contractors). A bit of a shame, as the old bridleway was more of a standard trail, and being further up the valley and more open than the other track, it had more of a remote feel. One of those trade-offs I guess. Apparently the lower part of the old track will be left to grow over. Really? Well thanks for that pointer. Maybe I should go back and find the old one before it’s too overgrown. I found it slightly confusing to get part way up and the look down and see a poled route coming up to where I was from somewhere different. As you’ve said, that other route appeared to be more interesting, too. Hahaa — I found the old on during this after I walked down from near the end of Horokiwi Road, then straight back up what I presume was the old Bridleway track. (That link doesn’t actually explain it, though.) The lowest part of it was more overgrown than I anticipated, but otherwise it was alright.